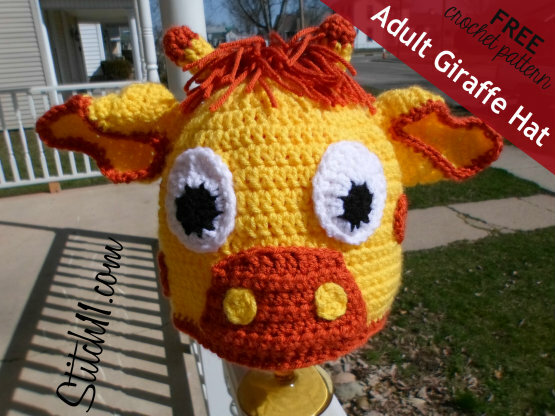 A few weeks ago I shared a free crochet pattern, for the 6-12 month Giraffe Ha… within minutes of posting the link on my Facebook page, I had multiple request for an adult version! This pattern is a yarntastic THANK YOU to all the Stitch11 fans for helping my dream to stay home with my daughter a reality. You hookers mean the world to me! Round 8-12: CH 3, DC in each DC around. 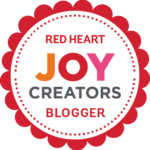 Join to top CH of CH 3. Round 13-18: CH 2, HDC into each stitch around. Join to top of CH 2. Row 7: Turn, CH 1, SC into same stitch. SC into next stitch. HDC into next stitch. DC into next 5 stitches. HDC into next stitch. SC into last 2 stitches. Finish off Secure the nose onto the front of the hat with yarn needle. Using the rusty orange colored yarn – HDC around the edge of the entire hat. When Single Crocheting across under the nose, still crochet through both loops. Round 10: Turn, Do not CH 1, Skip same stitch, HDC into next 7 Stitches. Round 11: Turn, Do not CH 1, Skip same stitch, HDC into next 6 Stitches. Round 12: Turn, Do not CH 1, Skip same stitch, HDC into next 5 Stitches. Round 13: Turn, Do not CH 1, Skip same stitch, HDC into next 4 Stitches. Round 12: Turn, Do not CH 1, Skip same stitch, HDC into next 3 Stitches. Finish off. SC around the opening of the ear with the rusty orange color of yarn. I did 1 SC for each HDC around. Repeat to make 2 ears. Finish off and attach to head.I attached them between rows 2 and 3. I didn’t stuff mine with anything but the little bit of yarn ends from changing colors. Round 3: Slip stitch in first 5 stitches, SC in next stitch.2 HDC in next stitch, 2 DC in next 3 stitches. 2 HDC in next stitch. SC in next stitch Slip stitch in next 5 stitches. finish off. 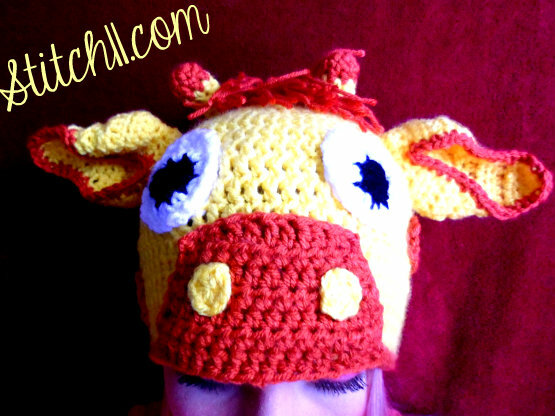 For Christmas this year I am crocheting my brothers and sisters, and their significant others, ridiculous animal hats. I have made 7 so far and have two left. I found the 6-12 month pattern for your giraffe hat and spent the last ten minutes figuring out how to make it adult size before realizing you had already done the pattern for adults! Thank you so so so much for posting these!! I can’t wait until Christmas, they are going to love these, I also used your lion hat pattern and it came out great! I’m off to crochet this adorable giraffe! Thanks again! I’ve just made this for my friends baby girl in peach and beige looks wonderful. I now have to make a purple and green one for her son ( his favourite colours) thanks so much for this it’s great simple and reasonably easy to follow. Your really good at this thanks again.